Really, the camping is 'feet in the water' ! Camping La Romiguière is the ideal place for lovers of nature. The campground is located by Lake of the Selve. We have direct access to the lake with neither road nor path to cross. From the private beach of Campsite La Romiguiere, you can swim (the water exceeds 25°C in summer), sailing or fishing, rent a rowboat or paddleboat, practice Jetski, water-skiing or just enjoy the sun. For you and your childrens' safety, a swimming zone is delimited and supervised during the summer. Lastly, our swimming-pool (heated during the summer) reserved to the campers is surrounded by a vast terrace with deckchairs. A pataugeoire will charm youngest. Our swimming pool measures 17 m X 8 m. It has a minimum depth of 80 cm and maximum of 1,80m. A tilted slope allows access to the swimming pool for disable persons. The lake of Selve (also called Lake of Maury) spread over 167ha. The campsite is located at the south-east point of the lake. According to the needs of water for the dam of Maury or water level of the river Lot, the level of the lake can vary. Certain years, your site will be almost "feet in water", and other years, it will be necessary to walk not more than a hundred meters to reach water. 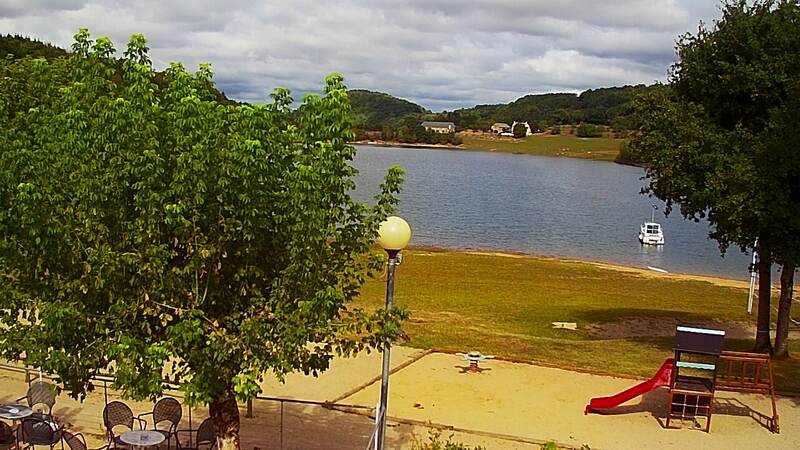 At any time, you can have an idea of the water level by having a look to our webcam. Anyway, our private floating pontoon, being able to accomodate 16 boats, offers a comfortable and easy access for the nautical activities. 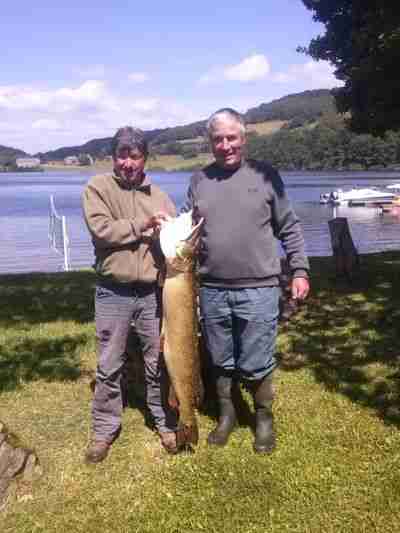 The Lake of Selve (sometimes also called Lake Maury) is renowned for its fishing waters. This lake offers an area of 167 ha for a depth sometimes exceeding 50 meters. It is fed mainly by two rivers, La Selve and Le Selvet .. Here you can fish pike, perch, brown trout, carp, perch and crayfish too. Carp night fishing is allowed. You can fish allmost everywhere on the lake. You will easily find lot of nice spot all around. Of course, it is also possible to fish from the beach of the campsite. Vous can bring you own boat or rent one here. Of course, fishing is allowed only to a fishing license owners. Ask us for any informations ! The Lake of Selve offers 167 ha of wild nature. The portion of lake located opposite the Campsite Romiguière is more than 4 km long ! Let's go exploring the small splits and to observe the birds and fishes of the lake. Campsite La Romiguière proposes to you to rent boats (with oars or electric engine), Canoes or pedal boats. In addition, the soft slope of the beach of Romiguière is the perfect place to dive your Jetski or your boat. You can also rent a place at our private floating dock. The Lake of Selve is ideal to discover JetSki or to practice Water skiing. About 700 meters far in front of the campsite is a peninsula called Oustrac. Beyond the peninsula is an area reserved for water skiing or jetskiing. So you can indulge your passion without restraint, without disturbing other guests wishing to enjoy the tranquility of the beach. We rent placements to our private dock, your boat or jet and will be safe. For jetskiing or water skiing, a speed zone is availlable on the lake. Finally, you can bring your own boat or your own jetski and rent a place at our floating dock.